An old-school gold rush kicked off in the Pilbara goldfields last year, following the discovery of hundreds of gold nuggets uniquely shaped like watermelon seeds. Sole prospectors and exploration companies alike flocked to the area in search for these nuggets hosted as conglomerates (groups in rocks), on or near to the Earth’s surface. 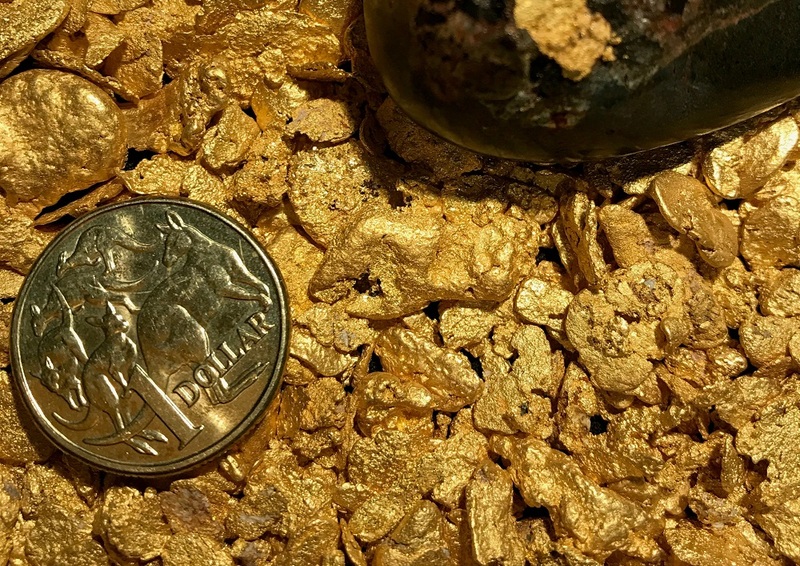 One company, Artemis Resources, recovered 547g of nuggets from prospecting the area in just four days. While the nuggets are valuable in their own right (their bounty was roughly worth $25,000) the hype since has focused on what they might mean for bigger gold discoveries in the area. Could these nuggets be a fruitful sign of a profitable gold deposit hiding below the surface? Is there potential for a whole series of new discoveries of similar mineral rocks across the region? Speculation has drawn similarities to the host rocks around Witwatersrand (aka Wits) gold deposit in South Africa, arguably the largest gold deposit in the world. Right now, we don’t have any scientific evidence to back this claim. What we do know is that these nuggets are different from most of the known gold reserves in Western Australia, such as around Kalgoorlie. Until we look into the geology of the rocks and how they formed – in other words, the origin of the mineralisation – more questions than answers will remain. We’re working with Artemis Resources to get to the bottom of how these unusual gold nuggets formed and why they exist. Our research will investigate different possibilities of how the nuggets formed, such as whether the gold was laid down as part of the sedimentary rock or introduced by hydrothermal fluid flow underground. We’ll also be looking beyond the host rocks themselves at the broader area, as understanding this bigger picture is key to accurately predicting what’s underground. The aim is to test the models, as well as to come up with new tools, which can be applied to understand the area’s prospectivity and help Artemis better target their exploration program. The project brings together a team of experts in both gold deposits and sedimentary rocks who will use advanced analytical techniques to understand the characteristics of the gold and their host rocks. And, we could have the answers in as little as a year – so stay tuned. We’re a trusted advisor to the Australian exploration industry, focused on research and innovation to enable the next wave of mineral resource discoveries. We work with more than 50 exploration companies each year from juniors to the major miners. Check out our innovation in the minerals exploration space. Gold obviously deposits to fit the void available to it, and since the nuggets are similar in shape and size that indicates formation in a rock that is very uniform in texture over a wide area. I can imagine a gneissic rock in a vertical orientation, and gold depositing in planes of contact,(weakness) between contrasting mineral bands. The individual gold lumps would have, in place, been connected by the thin gold film conduits, lost in the erosion and deposition process. What is the accompanying geological medium where the gold seeds are found? It would be fair to suggest that the oval voids within which the mineralisation/crystalisation of the gold took place may have been created by elastic stretching of a gaseous bubble matrix host rock under extreme heat before final deposition and subsequent erosion. I am also reminded of the vitreous gas bubbles found in lava flow tubes and commonly in metalworking slag run-off globules. Electro-Microscopy should reveal the unusual arrangement of the gold atom matrices.Do keep the world informed of any test results. My gut feeling is that ice was involved in the process at some point in the life-cycle of the mineral deposit. The watermelon seed shapes and the fine gold halos are very unusual structures and we are interested to try and find out more about them. They are a bit like bubbles but flattened, hence the watermelon seed name. The gold nuggets are found in a conglomerate, a type of sedimentary rock, but we are still investigating where they came from. Be sure that we will keep you posted as our study develops. We are told Gold is formed in supernovas, perhaps comets accrete it as they travel through space only to release it as they crash to earth. I imagine the gold would melt as it travels through our atmosphere due to friction forming tear drop shapes like gold rain drops, that shape may change into watermelon seeds if it lands in water. The WA Geological Survey has just published some information on the gold found in young sediments in the Pilbara. Their conclusion is that the Warrawoona Conglomerate has lenses of alluvial gold within it and that weathering and erosion has liberated these gold nuggets into the present day regolith but in restricted parts of the Pilbara. In contrast, the Witwatersrand Conglomerate is widely mineralised almost throughout its entire aerial extent, quite different to the much more localised mineralisation of the Warrawoona sediments.